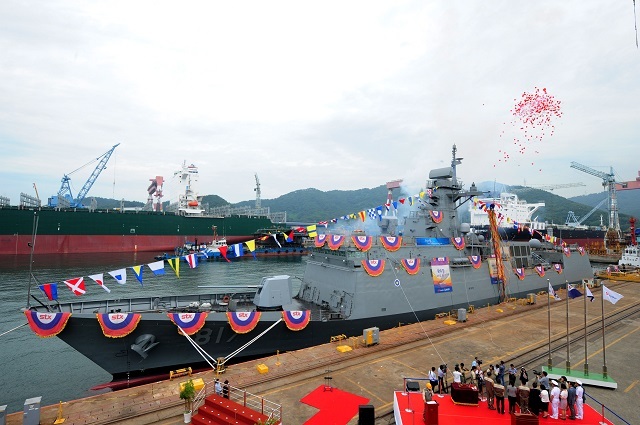 The sixth Incheon class FFG (Guided Missile Frigate), ROKS Gwangju, to protect South Korea territorial waters, was launched at a shipyard of STX Offshore & Shipbuilding in Changwon, Gyeongsangnam-do on August 11. ROKS Gwangju, which is in the 2,300-ton class, is 114m in length, 14m in width and 25m in height. Its maximum speed is up to 30 knots (55.5km/h), and it can accomodate about 120 sailors. Its main duty is to defend areas of the sea, secure the maritime control and protect sea traffic routes. It is equipped with domestic offensive weapons such as ship-to-ship guided missile, Haeseong, and light anti-submarine torpedo, Chung Sang Eo. 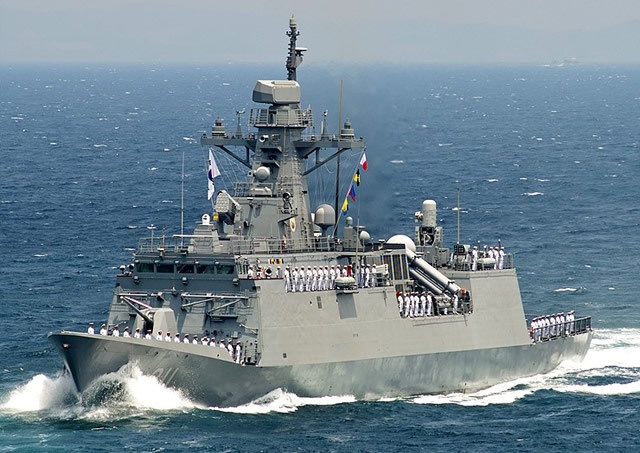 It is also fitted with a 5-inch (127mm) main gun, RAM (Rolling Airframe Missile) and CIWS (Closed in Weapon System), which is capable of intercepting an antiship missile. It is also expected to make a great contribution to countering the North Korean threat with its excellent antisubmarine warfare, as it is equipped with TACM(Torpedo Acoustic Counter Measure), which can trick the latest sonar or torpedoes, and 1 Lynx ASW helicopter. In addition, according to the ROK Navy it applies the stealth method to the body of the ship, which minimizes the radar cross-section, to increase the survival of the ship and of its sailors as well. The rate of domestic main equipment, in particular, is far beyond 90%, and includes 3D track and scan radar, Sonar, medium long-range tactical strike weapons system, etc. ROKS Gwangju will undergo test navigation and examinations before being handed over to the Navy for deployment by the end of 2016. “The next frigate will allow our defense ability for near sea to be improved so that North Korean threats can be deterred. If the enemy provokes us, we’ll instantly punish them and bury them at sea,” said a navy spokesperson.